So there we were, at a Brazilian Steakhouse in mid-town Manhattan, celebrating my birthday. Gathered around the table were Lisa, Niue, Rich and, his wife, Christine. I first met Rich inside what we called the Taj, the cavernous semi-hard, bubble-like structure FEMA constructed for workers to eat and find respite at Ground Zero. I was a chaplain, Rich was an investigator, and as I recollect, he was reading the Daily News as I sat down nearby with a cup of coffee. Over the next several months we would run into each other quite often, with Rich always excited to talk about his faith in the Lord Jesus Christ. 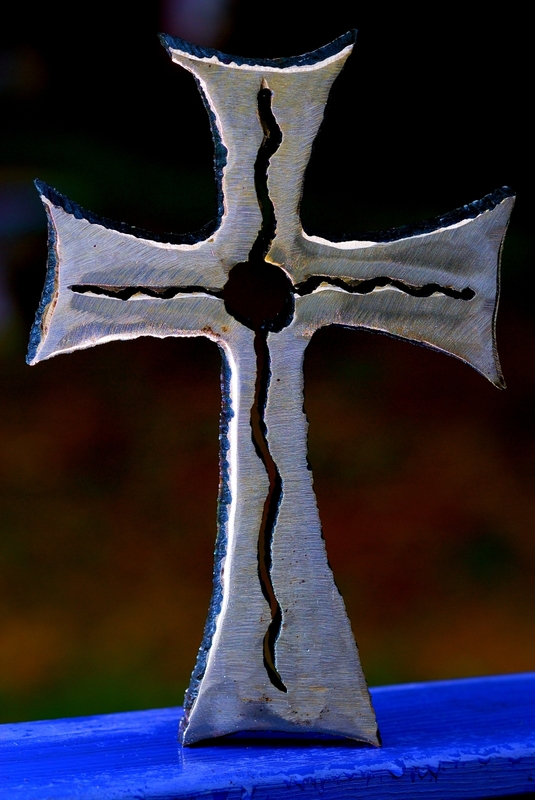 Indeed, it was a cross, freshly carved by a torch from the substance of the last remaining structure damaged on 9/11. Countless times I had viewed the old Deutsche Bank Building, with the gash in front, covered by heavy industrial cloth and adorned by an enormous American flag. Never would I have imagined owning a piece of this history, and that such a raw, yet incredibly urbane possession could inspire deeply profound emotion. As it happens, I do not own many religious symbols, I think mainly because they usually fail to capture and adequately express the spiritual reality inside my soul that God blesses me with every day. However, within milliseconds, this new addition to my worldly goods immediately gained the status of being most prized and valued. Feeling its blackened, scarred and scalloped edge and probing its seared out hollow center makes me think of Ground Zero and many dark days of injury and mourning. Yet, as my eyes encounter the gleaming, meticulously burnished front, I am struck by the Light that darkness can never overcome. In my mind, the burly, broadly tattooed welder who fashioned this piece is a natural genius. Holding this heavy object, I remember lingering bluish green smoke and debris, and those who chose to rush headlong into harm’s way. Still, just as vividly, this Cross calls to mind images of Rich and Christine — good friends we improbably gained, in a season when so many relationships were severed and stolen. Easily, my gift is one of the most beautiful crosses I’ve ever seen. It will always stand as an enduring testament that truly solid things can emerge out of terrible brokenness and tragedy. Disasters and devastation will occur, but out of the cauldron of crisis, enduring faith and steadfast friendships will emerge. They will be stronger than steel, and permanent in the Kingdom of God. EVERY so often, I find myself being morally obligated to publicly repudiate something, and make it very clear where I stand. It becomes necessary, if you’re going to occupy the pulpit, to stand up and be clearly counted. And so, we had a pastor of the Dove World Outreach and copycats threatening to burn copies of the Quran on the anniversary of Sept. 11. Because silence can imply assent, I see no choice but to openly reject this idea in no uncertain terms. It’s juvenile, it’s not biblical, it’s dangerous. Churches and organizations choose their names with deliberate, symbolic intention. With the dove being a sign of peace, how incongruous it is for Dove World Outreach to be acting with such hostility. The fact is that not only is it tempting, it’s downright simple to abandon responsibility by saying, truthfully, that I personally had nothing to do with the offense in question. But no matter how isolated or unusual, when a disgraceful ideology is given a large platform and is justified by the use and abuse of the Christian faith, then faithful Christians have to speak out. If we don’t answer for hatred in our wider family, we can’t speak with integrity about God’s love for the whole world. When crazy ideologies are enacted, it’s not enough for Christians to say, “Our faith isn’t like that.” It’s apparent that some in the faith think it is. It’s not enough to distance ourselves from evil in our house. When it arises, we have to own it, engage it and even if we didn’t cause it, we have to try to put a stop to it. This is a principle good Christians have always lived by, and it’s a principle I respectfully suggest for good Muslims as well. There’s no question that those who would like to build an Islamic community center two blocks from Ground Zero have that right. The question is: Are they right? Community houses and religious institutions choose names for a reason, which is why the Cordoba Initiative, which proposed the Islamic project, jumped out at me. The city of Cordoba was the center in Iberia of the old Islamic empire, something known as the caliphate. The restoration of this caliphate is something Osama bin Laden and his ilk have called for. People can bandy about what the intentions of the Cordoba Initiative were, but that doesn’t matter. What matters is what “Cordoba” means to multitudes of Islamic terrorists. To them, Cordoba is a blatant reference to the stated goals behind bringing down the World Trade Center. As the word spread about this, the project’s name was changed to Park 51, a street address, but I find it incredibly mystifying that thoughtful people would have a “Cordoba” initiative anywhere in lower Manhattan. The knee-jerk response to those who question the project is to say they’re bigots or “Islamophobic.” Maybe, they’re just sensitive and intelligent. We’ve all seen how quickly Louis Farrakhan can organize huge gatherings at the Lincoln Memorial, giving voice to all manner of things. We see how quickly mass marches emerge around the world when a European cartoonist depicts the Prophet Muhammad. I know it’s reprehensible for someone to deliberately burn the Quran. But where is the in-house, widespread outrage when young Afghan girls going to school get burned with acid thrown by Islamic radicals? Where are the in-house, mass demonstrations when schools for Islamic women get bombed, and when young Islamic women are systematically targeted with poison gas? Aren’t people more holy than books? I’ve heard from Christian apologists that Islam is a religion of peace, that the radicals are a minority who have hijacked the religion. So, where is the majority willing to take back the plane? Over the last nine years, if there had been large Islamic public protests against al-Qaida and its allies, the building of Park 51 might not have mattered. In its present form, of course, the community center should be allowed. But, I don’t think it should be built. As a Christian and an American, I respect it, but I don’t support it. The Rev. Bill Keane is senior minister at First Baptist Church of Branford. This article is excerpted from a sermon he gave Sunday. From October 2001 through June 2002, under the auspices of the Salvation Army, Keane worked as a chaplain at Ground Zero. You are currently browsing the BillKeane Perceptions blog archives for September, 2010.